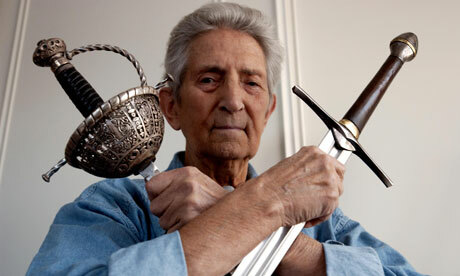 Bob Anderson, a former Olympic swordsman who staged fights for films including the Star Wars  and Lord of the Rings  series, has died, British fencing authorities said today. He was 89. The British Academy of Fencing said that Anderson died early on New Year’s Day at an English hospital. Anderson donned Darth Vader’s black helmet and fought light saber battles in two of the three original Star Wars films, The Empire Strikes Back and Return of the Jedi. The villainous character was played by David Prowse and voiced by James Earl Jones, and Anderson’s role was not initially publicised. Robert James Gilbert Anderson was born in Hampshire in 1922. He served in the Royal Marines during the second world war and represented Britain in fencing at the 1952 Olympics and the 1950 and 1953 world championships. His first film work was staging fights and coaching Errol Flynn on swashbuckler The Master of Ballantrae in 1952. He went on to become one of the industry’s most sought-after sword masters, working on movies including the James Bond adventures From Russia With Love and Die Another Day; The Princess Bride; The Legend of Zorro; and the Lord of the Rings trilogy. Fencing academy president Philip Bruce said on Monday that Anderson was “truly one of our greatest fencing masters and a world-class film fight director and choreographer”. Anderson is survived by his wife Pearl and three children.